In Japan one can easily find numerous STI versions of Subaru products but for US till date, Subaru STI was the most extreme you can find of the WRX all-wheel-drive performance compact. With the unveiling of Subaru STI Performance Concept at the New York Auto Show, speculations are that this trend will definitely get changed in coming time. 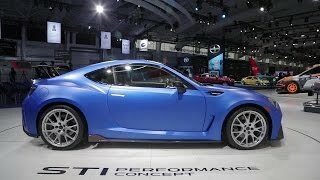 The Brand at the NY Auto Show 2015 clearly indicated its intentions to expand the STI’s in U.S.
BRZ and Forester have their high performance automotives modified by STI, in such state probability is high that a car similar to the dangling BRZ will take the brand to gleaming roads. At the New York Auto Show the company didn’t talk much about the technical specifications but with the words used while introducing presumptions and estimations started taking its peak. The Subaru STI Performance Concept 2015 is anticipated to roll down the streets somewhere by mid of 2016. The model is anticipated to fall around $ 30000. Though there isn’t much shared in context to the STI’s new model’s specifications but we still have the pupil to take the closer look at the Interior, Exterior and the Performance of this newly presented Subaru STI Performance Concept 2015. To have the better look at the Interiors we have a small exercise for you. Relax!! It isn’t that tough, all you gotta do is sit back, close your eyes and let the reel begin taking you to the STI-modified BRZ. Now that you are in the arena just imagine the same getting more better with the aggressively bolstered performance seats, a family steering and yes not to be forgotten a functional array of auxiliary gauges. 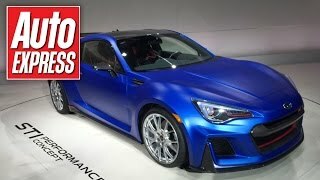 However the BRZ is already one from the focused performance category, so we believe that not much of upgradation is required in its interiors. Talking about exterior and mentioning modified works, is definitely an expected narration you people presumed. However we would just throw some light upon a result of factor analysis. The STI Performance Concept 2015 is more extreme than the limited production, Japanese roller storm BRZ tS. The front and rear fascias will be adored with more aggressive air intakes, putting endeavors to pull air away from hot brakes and simultaneously improving underbody aerodynamics. The Subaru STI Performance Concept 2015 also has a carbon-fiber roof panel to help center of gravity. The Performance Concept 2015 will have the 2.0 Liter boxer four cylinder engine, the same used in the BRZ GT300 racer. The engine will be capable of producing 300-Horsepower making it a powerful drive for buyers. As estimated the vehicle will touch 0-60 in 5 seconds while the top speed is anticipated to be close (up or down) 155 mph. This was all as of now and for those who are simultaneously looking for other options here is a clue. 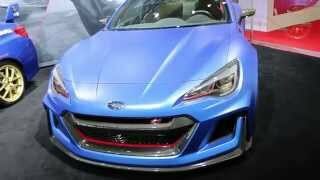 The Subaru STI Performance Concept 2015 might face a tough competition from Hyundai Genesis Coupe and SQ5.